In the 1950s and 1960s in Europe, especially in Germany, the demand for the new building materials and technologies in the construction industry grew rapidly, but due to labor shortage at that time(especially the lack of experienced skilled workers), labor costs were very expensive. The construction period has to be shortened also, therefore, multi-functional new building materials that can improve efficiency and meet different requirements are generally welcomed, and building material products are also diversified, the has a higher requirement for the quality and construction performance of building materials. The traditional on-site mixing mortar can no longer meet the requirements. Since the 1960s, the combination of modern construction and chemical industry in western countries has promoted the development of dry mortar, which is mainly reflected in the following three trends:(1) on-site mixed mortar replaced by pre-packaged dry mortar;(2) rapid development of dry mortar applications, including bulk transportation systems(such as silos), automatic mixing machinery for dry mortar and water, and mortar mechanical spraying equipment; (3) using polymers adhesive(such as redispersible powders) and special additives(such as cellulose ether) for mortar modification thchnology are increasingly perfect, thereby improving the quality of mortar products and meeting the construction requirements of the modern industry. Dry mortar production originates in Austria and Finland. With the continuous improvement of the quality of wall material products, the wall surface is more and more flat, no need to apply thick mortar to level, only a thin layer of mortar on site. Therefore, in 1958, a Finnish company began to develop dry mortar products for thin-layer mortar. It was produced and put into use in 1961, during which time Germany began to produce dry mortar. The development of dry mortar has changed many times since its inception. In the 1960s and early 1970s, the dry powder mortar factory in Europe adopted a horizontal process, which arranged the raw material warehouse one by one on the ground. 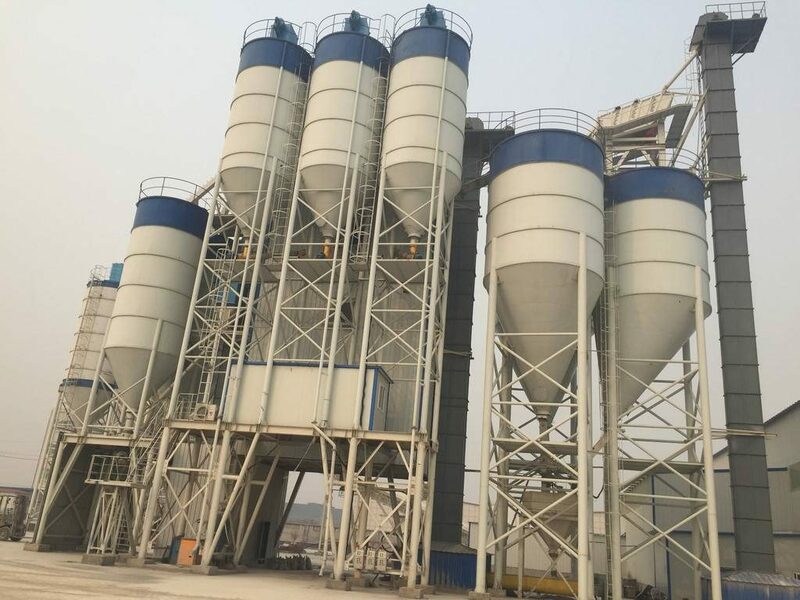 The raw materials were first stored in the silos through the lifting equipment, and the raw materials were discharged from the silos, after weighting, it enters the mixer through horizontal conveying equipment, and then rises into the product storage bin. Finally it is shipped through the packaging and bulk process. This method has become the first generation of dry mortar production plant. The shortcoming is that the materials need to be repeatedly raised and lowered, all the equipments are high, the energy consumption is high, occupy large area of floor, and the operation flexibility is poor. In the 1970s and 1980s, the second generation of dry mortar production plants appeared. The idea was to simplify the whole process, that is, the materials were raised to a high place at one time and dropped at one time. The factory building is therefore designed in the shape of a tower. The raw material warehouse is built on the top of the tower. Under the warehouse, the weighing, mixing, packaging and bulking processes are carried out. The raw materials are discharged from the warehouse and then passed through various processes to become the final product. Compared with the first generation mortar factory, the second generation dry mortar factory has the characteristics of small footprint, simple structure and few equipments. However, the disadvantages is that the screw feeder is used for batching, the equipment maintenance workload is large, and the silo exit is often blocking and effects the normal production. In the 1990s, due to the invention of pneumatic floatation sheet technology and the emergency of double butterfly valve, the third generation of dry powder mortar production plants emerged. The material completely relies on its own gravity flow. The whole production process has no horizontal conveying equipment, the structure is more compact, the floor space is smaller, and the equipment used is simpler and more reliable. Low consumption, fast production and higher precision of ingredients.